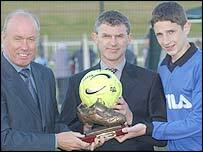 Glengormley youngster Craig Cathcart has won the Northern Ireland Youth Player of the Year award. He has attracted interest at Manchester United and a string of other top flight clubs. Northern Ireland manager Sammy McIlroy was one of the admiring spectators at the Billy Neill Centre of Excellence at Dundonald as Craig underlined his class during the Ulster Bank and IFA County Youth Championship finals night. "The lad is a terrific prospect," said McIlroy. "He is comfortable on the ball and I know there is already a lot of interest in him across the water." Cathcart's performance also caught the eye of former Northern Ireland international and Glentoran ace Jim Cleary. "There is no doubt Craig can go far. He is simply a natural. He reads the game well and knows exactly what to do in any situation," said Cleary. The Old Trafford youth coaches like the look of the central defender and have watched him at close quarters. It is the same story at Arsenal, Blackburn Rovers, Manchester City and Rangers. Craig's father George, a fitter in Belfast aerospace company Shorts, was a goalkeeper with Ballyclare Comrades, Distillery and Crusaders in the Irish League and Amateur League club Nortel. "Craig has really only taken to playing the game seriously since he was 10, turning out for Carnmoney Colts. Then he switched to St Andrew's Boys' Club and things have really taken off for him since then," said the proud father.